Wild trout populations in the study section increased approximately threefold from the baseline Year 1 (2010) season to the final Year 4 (2013) season. 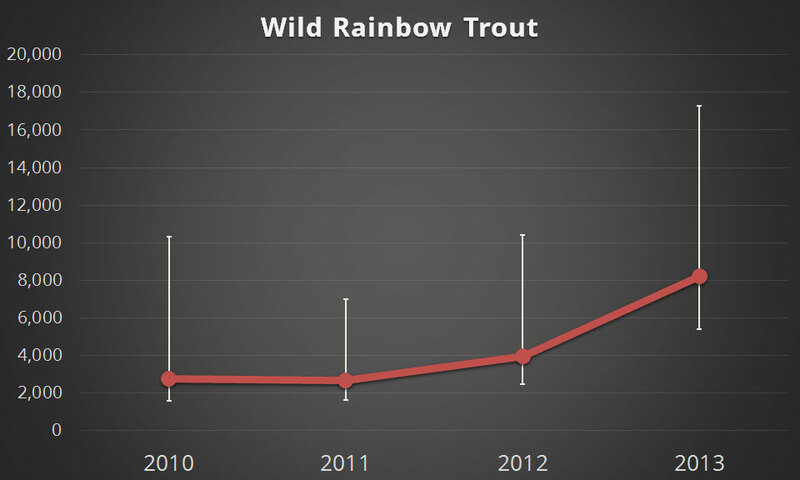 Growth in the wild rainbow trout population lagged behind the cutthroat trout population. The estimated wild trout population grew dramatically between Year 3 and Year 4 of the study as shown in the graph at right. Overall, the estimated wild rainbow trout population increased from 2,736 in 2010 to 8,225 in 2013. The estimated density of wild rainbow trout increased from 536 fish per mile in 2010 to 1,613 fish per mile in 2013. The cutthroat trout population was the first to show substantial growth. 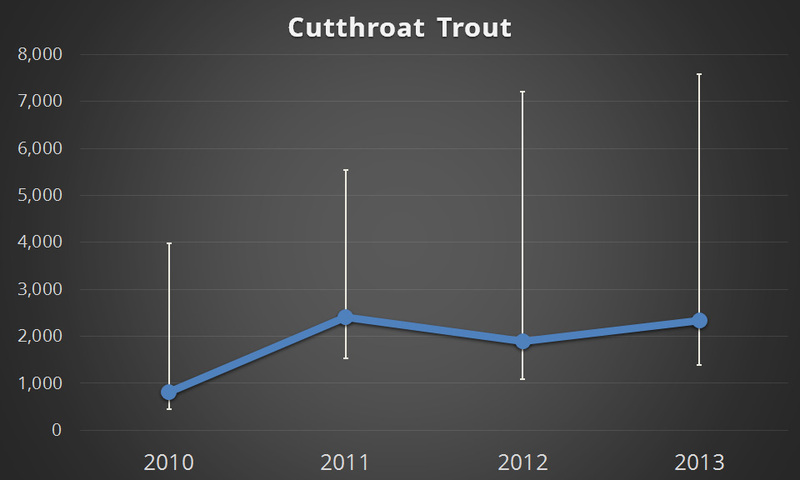 The estimated population of cutthroat tripled between Year 1 (2010) and Year 2 (2011) of the study, then dropped in Year 3 (2012) before rebounding in Year 4. Overall, the estimated cutthroat trout population increased from 820 in 2010 to 2,346 in 2013. The estimated density of cutthroat trout increased from 161 fish per mile in 2010 to 460 fish per mile in 2013. 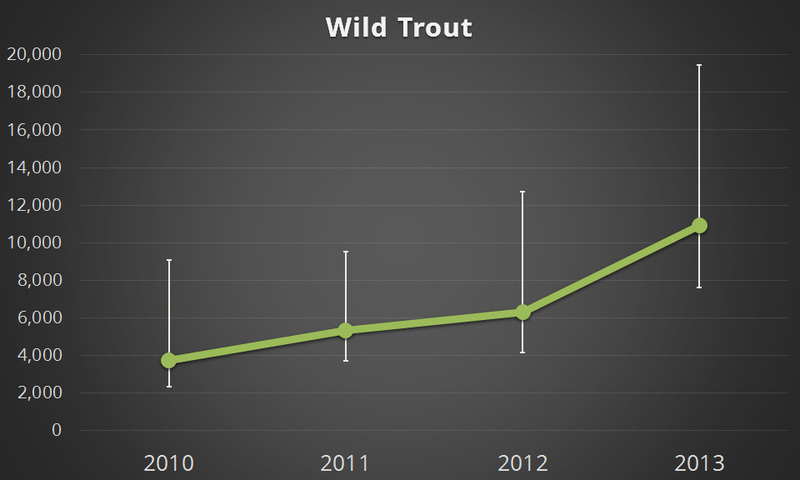 The total wild trout population (rainbow + cutthroat) estimate increased from 3,717 in 2010 to 10,929 in 2013. The estimated number of wild trout per mile increased from 729 per mile in 2010 to 2,143 per mile in 2013. The composite wild trout population estimate increased on a year-over-year basis for every year of the study. More fish overall. More fish per mile. 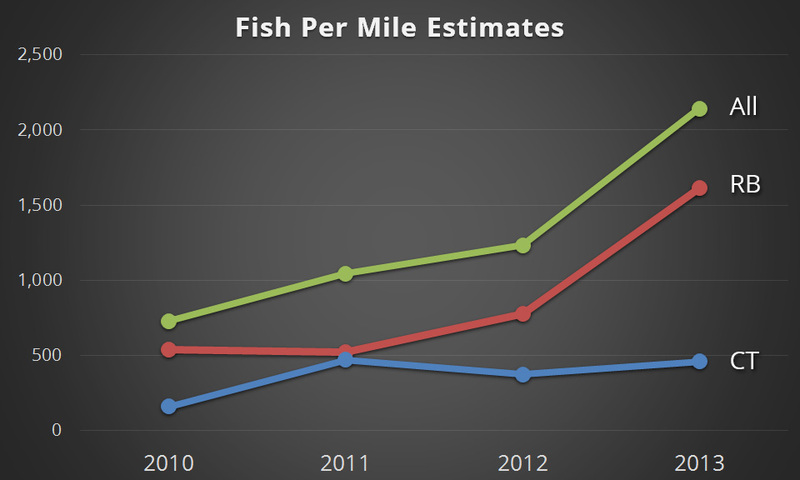 The estimated fish per mile at right was calculated by dividing the total estimated number of fish in the study section by the 5.1 river miles. “Fish per mile” is commonly used in the fisheries community to describe the relative productivity of a trout stream. As our maps and data products show (and most fishermen know), the fish are distributed unequally throughout the river – some spots have more fish, some fewer fish. We’ve got that! Check out our reports for all the detail you could ever want! These histograms display the percentage of each species within a given length category. Note that the study field dates changed over the course of the four years – sampling happened earlier in 2010 than it did in subsequent years. This may have affected the length distribution of fish caught in 2010. The overlapping date histograms that follow this section control for this variation. These histograms display the percentage of each species within a given length category. Generally, more small fish were caught in the later years of the study during the May-June period. The Chapman Modified Schnabel Method of population estimation produces the results displayed below. Confidence intervals are given at the 95% confidence level as per standard practice. However, such strict expression of confidence is of limited utility in evaluation of longitudinal / trend data. Additionally, these estimates and limits are frequentist (non-Bayesian) in nature; they do not account for previous years’ data. A Bayesian approach would have likely resulted in significantly narrower credible intervals for later years’ estimates. The wild trout data (both rainbow and cutthroat) for each year was pooled in order to yield a composite estimate of the wild trout population in the study section. Pooling the data increases the degrees of freedom in the sample and the corresponding coefficient within the estimation model. Thus, the output is slightly different than the sum of the rainbow and cutthroat data. Similarly, variance is reduced with pooled data so confidence intervals are narrower. There’s far more in the reports than we could publish online.